Panel Chair: Sally Jordan (Open University, UK). Hosted by Dr Mathew Hillier, Monash University, Australia. Starting 07:00AM UTC/GMT. Duration 1 Hour. 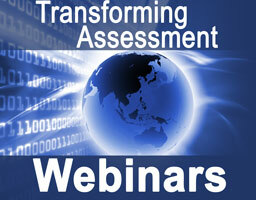 This is a joint webinar organised with the Assessment in Higher Education conference secretariat. 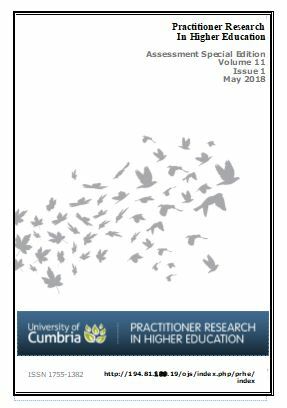 A panel of three selected presenters from the International Assessment in Higher Education 2016 professional education seminar (held 30 June) discussed the topic of “Transforming Assessment and Feedback in Higher Education on a wider scale: the challenge of change at institutional level“. The central addressed at the day event was that while many assessment innovations and research studies are carried out by individuals within a specific module or programme and we lack sufficient evidence of successful efforts to make wider departmental or institutional change in line with our growing knowledge of good practice in assessment. The on-site day event included presentations and discussion of initiatives or research projects that address the challenge of establishing wider and more deep-rooted transformation. 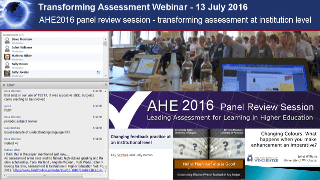 This webinar session took form of a panel review of key findings from the AHE2016 day event. Each panel member contributed to the discussion with a short overview of their presentation from the day event followed by questions and discussion between the panel and the webinar participants. Abstracts of panel session presentions – further details PDF.